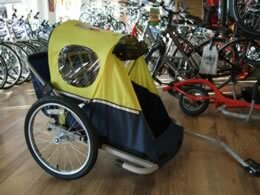 Using a bike is a practical, economical and environmentally friendly way to travel with children. Whether you’re looking for the fun of a family ride, or an alternative way of getting the kids to school, cycling helps you to teach your children to be healthier, happier, more confident and independent. 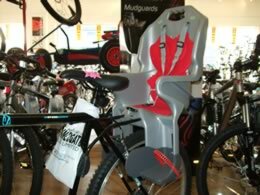 A child seat attached to your rear rack and allows your child to watch the countryside go past and keep an eye on your riding! All seats should confirm to british standards and be fitted by a competent mechanic. Most trailers are designed for one or two children. Maximum capacity for a two seater trailer is usually two children up to about six years old. They don’t affect your centre of balance, and if the bike falls over, a good trailer won’t. They also allow you to carry extra belongings with you, and shelter the child from weather. It is advisable to fix a tall flag to the trailer to improve visibility. 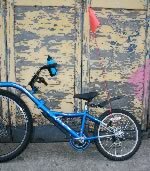 Tag-alongs are a great way to allow older children to ‘join in.’ They usually secure to your seat post. As with a trailer it is a good idea to fit a flag to make it easier for cars to see it.